Just in yesterday, haven’t even had the time yet to assemble it! When you look at the PCB’s, you’ll see that the extra headers have all been removed, there is just one 9-pin header left – the “IOX” signal from v1 now controls power to the RFM12B. Through a sneaky placement of the ISP header, there is still a way to connect a single-cell AA or AAA battery to opposite ends of the board. This extra power control is intended to reduce the current consumption during startup, but I haven’t tried it yet. 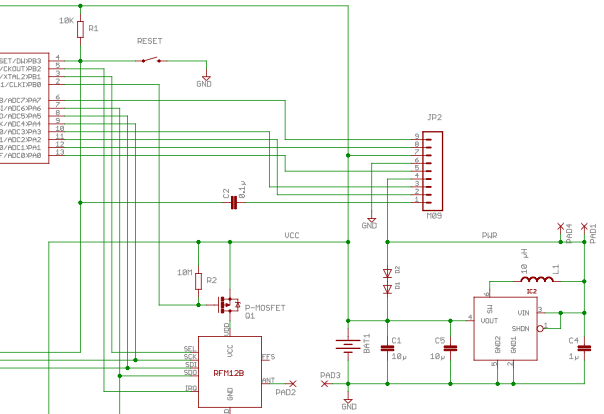 The idea is that the RFM12B will not be connected to the power source before the ATtiny starts and verifies that the voltage level is high enough to do so. After that, it can be turned on and immediately put to sleep – in practice, its power probably never needs to be turned off again. The latter might seem the most flexible one, but keep in mind that the boost regulator has a 15 .. 30 µA idle current draw, even when the rest of the circuit is powered down, so this is not always the best option (and the extra switching supply components add to the cost). As you can imagine, I’ll be running some final tests on all this in the next few days – but the new unit is now available for pre-order in the shop (“direct power” version only for now, the boost version will be available later this month). Design files are in the Café. It would be nice to interchange IOX (PB0) and DIO2 (PA1) such that one might have two completely separate pin change interrupt vectors in use. So I can turn the RFM12b off completely now? And wont kill anymore nodes when prototyping with reverse voltage screw ups (poor node… and me messing with 3.7v batteries. Went like “its not supposed to spark like… oh well that was fun while it lasted”). Hey, can I put in a future request for a jee node with a lithium batter charger circuit built in? Use a cell phone or 18650 battery… Have it charge from 5 v USB? 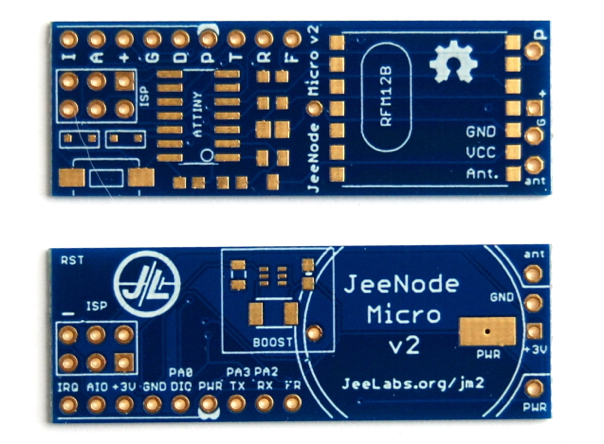 Andrew, there is already such a JeeNode – the JeeNode USB. The JeeNode USB won’t survive Andrew’s ways of connecting LiPos. Trust me. Fried nodes, anyone? In my defense, it was an 18650 that was really hard to tell which end was the positive and which end was the negative. fried nodes are mighty tasty. Do you suspect that its the atmega chip that died, the RFM12b that died or the both of them? @Andrew, in the microseconds it takes to destroy the junctions, you can be lucky and one sacrificed itself before the other. If there was an LDO in circuit, it often fries and saves the rest. A quick test is apply the correct polarity through a low value current limiting resistor and see what gets hot. Unfortunately, even if you can swap out parts and revive the node, it is now only suitable for breadboarding – the stress has shortened the life of the remaining “healthy” chips. @Andrew: there was bunch of heat and a nasty smell that seemed to originate from the LiPo charger chip. I’m just well enough equipped to check polarity, I certainly cannot measure anything beyond DC. So my test was to hook up the USB to a computer and all that I saw in Terminal was . I’m going to hand over the corpse to JC, for a post mortem. Always nice to know what you’ve done wrong.